In this tutorial I'm going to show you how to debug carbon kernel. This method is actually called the remote debugging. *For this you'll need a carbon which build from the source. Refer this post. *An IDE, For this I'm using IDEA. *Carbon based product I'm using WSO2 Application Server for this tutorial. Ok now first start the application server in debug mode. Go to AS-SERVER/bin and execute the following command. Now start the IDEA IDE. and import the kernel. Just select the root pom.xml and open. 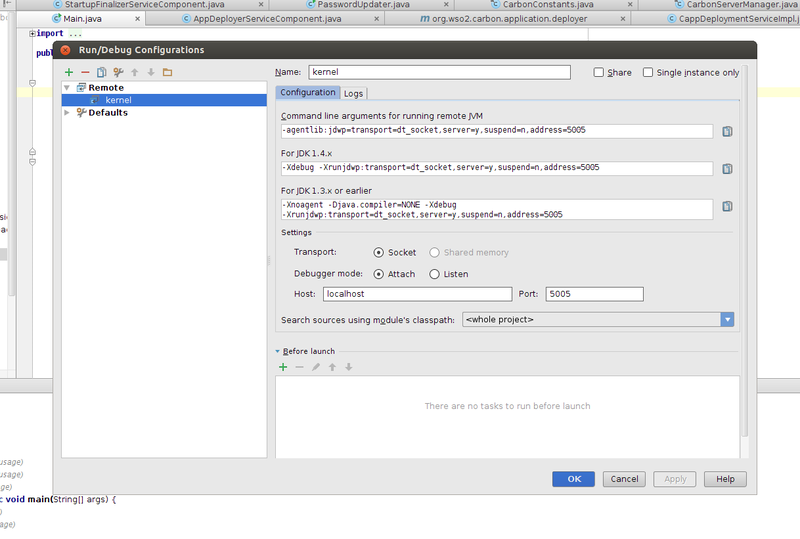 Then create a remote debug configuration. Go to Run --> Edit Configurations... Then press Alt + Insert and select Remote. Give a name to the configuration and complete by pressing apply. That's it you have configured the IDE and ready to debug. Put a break point and check if it's working. Let's put the break point in the main method. In the package org.wso2.carbon.server; put a break point to Main.java file. Then press Shift + F9 to start debugging.